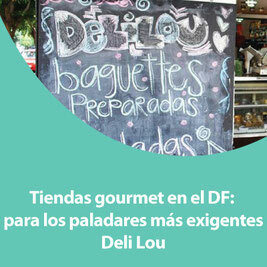 Deli Lou. Lleva pasteles horneados diariamente, vinos, cervezas artesanales, patés, quesos, mermeladas y jaleas, aderezos, sales y especias. It's going to be ending of mine day, but before finish I am reading this fantastic post to improve my knowledge. I visited several web sites but the audio feature for audio songs present at this website is actually fabulous. Hi there, You have done an incredible job. I will certainly digg it and personally recommend to my friends. I'm confident they will be benefited from this web site. When I originally left a comment I appear to have clicked the -Notify me when new comments are added- checkbox and from now on whenever a comment is added I recieve 4 emails with the same comment. Is there an easy method you can remove me from that service? Thank you! Hi there! I understand this is sort of off-topic however I needed to ask. Does building a well-established website such as yours take a large amount of work? I am brand new to writing a blog however I do write in my diary daily. I'd like to start a blog so I will be able to share my own experience and feelings online. Please let me know if you have any kind of suggestions or tips for brand new aspiring bloggers. Appreciate it! Exceptional post however , I was wanting to know if you could write a litte more on this topic? I'd be very grateful if you could elaborate a little bit more. Bless you! Thanks for some other informative website. Where else may just I am getting that type of info written in such an ideal approach? I have a mission that I'm simply now running on, and I have been at the glance out for such info. Everyone loves what you guys tend to be up too. This sort of clever work and coverage! Keep up the very good works guys I've included you guys to blogroll.